Audiowandlung der absoluten Spitzenklasse mit acht Unison Mikrofonvorverstärkern, neuem HEXA Core Processing und Surround Sound Monitoring. Vintage Analog-Hardware vs. Apollo & Unison Plug‑Ins. †Apollo x8p enthält das “Realtime Analog Classics Plus" UAD Plug-In-Bundle. Andere UAD Plug-Ins werden separat auf www.uaudio.de verkauft. Alle Marken sind Eigentum der jeweiligen Inhaber. Mit der umfassenden Unterstützung des Surround Monitorings bis hin zum 7.1 Format ist Apollo x8p ein Segen für Ingenieure und Produzenten, die an Audio und Musik für Games, Fernsehen und das Internet arbeiten. Darüber hinaus bietet Apollo x8 einen wählbaren +24 dBu Betrieb für die vorkonfigurierte Kompatibilität mit professionellen Mischpulten und anderem hochwertigen Pro-Audio-Equipment. Apollo x8p bietet 16 x 22 gleichzeitig nutzbare Inputs / Outputs (8 x 8 analoge I/Os)und zwei integrierte Thunderbolt 3Ports Dadurch lassen sich beliebige mit Thunderbolt ausgestattete Apollo Twin Desktop- oder Apollo Rack-Interfaces (bis zu vier Apollos) und insgesamt sechs UAD-2 Geräte problemlos miteinander kombinieren - und das System mit zusätzlichen schnellen I/Os und DSPs mit hoher Bandbreite erweitern, wenn der Bedarf im Studio wächst. In addition to my 500 series racks with API and Neve pre’s the unison pre’s give me extra colors. So easy and fun. I believe its the best ! Having the Apollo 8p and Twin, it was a no brainer to move my home studio up a notch with more I/O and pristine recordings. Even with these old ears, the difference is noticeable. More 'pro' sounding for sure. A few things on my wish list that I'm sure UA will take care of in the near future! Very satisfied though. I already had an Apollo x8 that I use along with a Neve 5024 on the four line inputs. I wanted 8 more channels, so the x8p was perfect. It was easy to set up with my existing gear, so I was back in business quickly with the 16 channels I need for an upcoming project. The only thing I would like better would be if they offered buyers who already have a UA unit a choice of some different freebie plugins when purchasing a second unit. I like the UA plugins and would have dug even a couple more with the new interface. The ones offered were the same as what I got with my x8. First of all, what an amazing piece of gear, and all of the hype about the sonics is real. The expanded monitoring capabilities for headphone mixes is awesome, and overall, I’m a super happy camper. That said, I had a time integrating this unit into my ecosystem. For background: I already own an 8p, a twin duo, and two satellites - running on a 2012 model Mac Mini and a 2015 model MacBook Pro. I just hit a spot where I needed the additional inputs for my studio, and found that the 8p that would have matched my existing one had just been taken off the market. 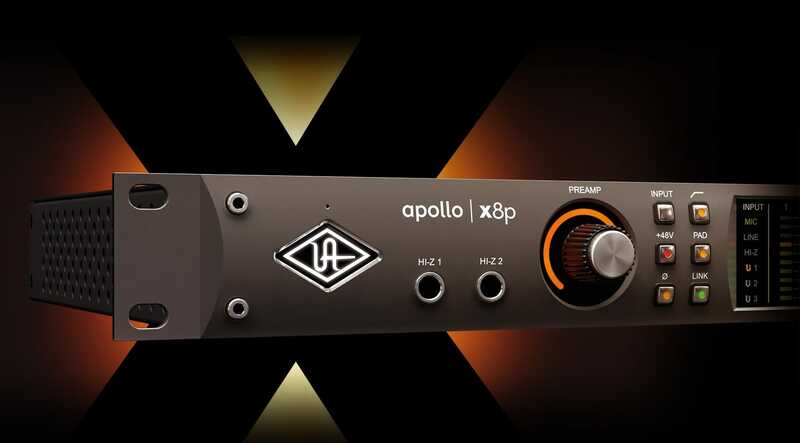 I thought that it would be cool to get into the x series of Apollos, but was worried about integrating, since everything I own is thunderbolt 2, but after assurances from my Sweetwater rep and researching the UAD website, I felt safe. Well... it turns out that the 8xp wouldn’t talk to my computer with the aftermarket thunderbolt 2 to 3 adapter Sweetwater told me I had to have, so on a Sunday afternoon with a major client arriving in the morning, I ran to the nearest Apple store (a mere hour away) to buy the Apple thunderbolt 2 to 3 adapters. After returning back to my studio, the Apple adapter allowed my computer to talk to the 8xp, but not the rest of my Apollo system. Eventually I learned this: I have to use the Apple adapter on the way in, and the aftermarket adapter from Startec on the way out, and it all talks! I guess all’s well that ends well, but I could have done without the panic and sweat and uncertainty. Having owned a Twin Duo I knew the quality of UAD, I am blown away by the clarity of this device. Having access to Unison Plugins is a game changer for me. The Best audio interface so far that i have! Great plugins specially the unison technology! This is the Greatest interface. I can use NEVE,API,MANLEY,etc.,preamps by UNISON technology. This is good to experiment for the music. 8 unison inputs, 8 ADAT inputs, 10 analog outputs, 8 ADAT outputs, 2 headphone outputs. Not even the x16 has that much flexibility. I have 4 of the x8p for 32 total unison preamps (and another possible 32 ADAT inputs on tap if I ever record a symphony or something lol). I honestly wouldnt ever use the spdif or adat's, though. The Unison preamps simply sound better than anything Ive stuck into the ADAT jacks. Im not even talking about using Unison ready plugins. Just using the naked UAD preamp, the quality difference between it and many other pro/consumer preamps is an obvious win for UAD. Ive had my studio engineer brethren come and test my kit out and Ive gotten honest smug approval reactions from the guys that own very, VERY expensive consoles. If you dont have the 100k++ to plop down for the real thing, this will honestly get you 97% of the way there. If you know how to record a sound with the correct gain staging, that will take you the other 3% and you will have so much more flexibility at your hands (with Unison preamp plugins and inserts) than anyone who owns a single piece of physical hardware. Yes, hardware rules. No mistaking that. But think about cost, maintenance, availability to ALL channels simultaneously, variance between different hardware units and most importantly: engineering skill. Spend the time to Get Good and you will overcome the hardware to software gap. The hexa core's are enough for you to run the industries very best preamp plugins in the Unison slot, then 2 more "heavy DSP usage" plugins in the Insert slot for all 8 Unison inputs. I had a mix of Neve, Helios, API and UAD preamps running into several classic comps and limiters which then all separately ran into individual tape sim plugins. I was hitting the 90% tile of usage for my DSP engine but I did not get any errors from the Console or hear any slow-down or artifacts in my recorded audio. If you spend the time and tweak this stuff to fit that particular drum kit and player and room, taking the sounds directly to tape (record the inserts directly to your DAW) then you will have an insane amount of flexibility to record a collection of sounds that could not be created with even the best multi-hundred-thousand-dollar studio (unless you have every single preamp and compressor and eq and own at least 8 of each!). The flexibility is bewildering at first and you might get lost. If you can stick with it and take it all in, you can do almost anything. Just follow good gain staging and microphone placement techniques and you will already be most of the way there. Also remember that you can go light on the Unison and Insert plugins and then go crazy with the exact same plugin chain later on inside your DAW durring mix-down. Stacking 2 of the same plugin is A-OK and will give you some really dramatic results. Taking your first iteration of these plugins to tape means that you have freed up all of your DSP so you can now re-use that hexa-core processor in your mixing stage. Im truly enjoying my experience with this setup. There is still so much to learn and so much to experiment with but having the options to try out different things is exciting and I welcome the challenge. I love coming up with an idea and then trying it out! On the basis of flexibility of inputs, quality of the raw sound (no plugins) and interface usability, this unit already wins. Add in the Unison tech and the UAD plugin library and youre pretty much looking at the best there is (shy of owning half a million dollars worth of gear). The hexa core's are enough for you to run the industries very best preamp plugins in the Unison slot, then 2 more "heavy DSP usage" plugins in the Insert slot for all 8 Unison inputs. I had a mix of Neve, Helios, API and UAD preamps running into several classic comps and limiters which then all separately ran into individual tape sim plugins. I was hitting the 90% tile of usage for my DSP engine but I did not get any errors from the Console or hear any slow-down or artifacts in my recorded audio. If you spend the time and tweak this stuff to fit that particular drum kit and player and room, taking the sounds directly to tape (record the inserts directly to your DAW) then you will have an insane amount of flexibility to record a collection of sounds that could not be created with even the best multi-hundred-thousand-dollar studio (unless then had every single preamp and compressor and eq and they had at least 8 of each!). Improved conversion with more power to boot! The sound quality improvement of the 8xp over my larger I/o count convertor was such a step up that I sold that and bought 2 more apollo’s, it was THAT instant. Added to that the inclusion of 6 chips vs. 4 in the earlier apollo’s and it becomes a solution that for me pulls triple duty. I run plugs as inserts when mixing FOH live via the adat i/o and some effects via analogue through the cue busses. I can record pre production at the bands rehearsal space WITH plugs and also with UNISON pre’s and I can also use it in my studio for tracking, again with plugs, as converters for my existing pre’s. Conversion with plugs post my analogue pre’s or just for mixing, either in the box using the monitor i/o, or bypassing the monitor and using spdif into my monitor controller or just using the analogue outs to feed my hybrid setup. Console II is briliant too, although I would like greater MIDI integration and ability to recall snapshots/scenes on the fly. It’s an incredibly versatile unit that just let’s me get on with the creative side of music. It works the way I want it to, not the other way round. A very big step upwards in AD/DA conversion! 6 processing chips and worth the price of admission. I absolutely love it!! Esto es una maravilla que hay que probar sí o sí tarde o temprano para el que aún no lo haya hecho. Es la mejor máquina con la que se puede trabajar. Va de fábula en Win 10 mediante USB C. Increíble tecnología y facilidad de uso, ruteo... Sólo tengo buenas palabras.